In one of the largest global studies of its kind, researchers conducted over 6,000 reef surveys in 46 countries across the globe, and discovered 15 'bright spots' - places where, against all the odds, there were a lot more fish on coral reefs than expected. "Given the widespread depletion of coral reef fisheries globally, we were really excited to find these bright spots that were doing much better than we anticipated," says lead author Professor Josh Cinner from the ARC Centre of Excellence for Coral Reef Studies at James Cook University. "These 'bright spots' are reefs with more fish than expected based on their exposure to pressures like human population, poverty, and unfavourable environmental conditions. "To be clear, bright spots are not necessarily pristine reefs, but rather reefs that have more fish than they should, given the pressures they face. "We wanted to know why these reefs could 'punch above their weight' so-to-speak, and whether there are lessons we can learn about how to avoid the degradation often associated with overfishing." 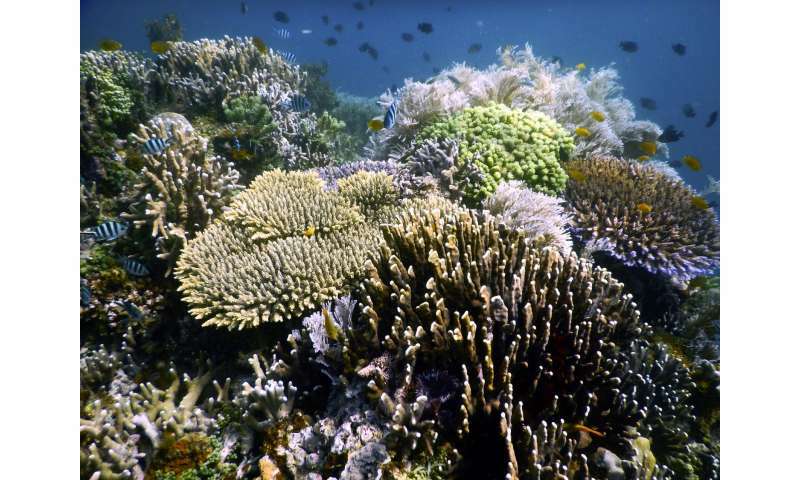 Co-author, Professor Nick Graham of Lancaster University says globally, coral reefs are in decline and current strategies for preserving them are insufficient. "Our bright spots approach has identified places we did not previously know were so successful, and the really interesting thing is that they are not necessarily untouched by man," he says. "We believe their discovery offers the potential to develop exciting new solutions for coral reef conservation." "Importantly, the bright spots had a few things in common, which, if applied to other places, might help promote better reef conditions." "Many bright spots had strong local involvement in how the reefs were managed, local ownership rights, and traditional management practices," says co-author Dr. Christina Hicks of Lancaster and Stanford Universities. The scientists also identified 35 'dark spots' - these were reefs with fish stocks in worse shape than expected. "Dark spots also had a few defining characteristics; they were subject to intensive netting activities and there was easy access to freezers so people could stockpile fish to send to the market," says Dr. Hicks. This type of bright spots analysis has been used in fields such as human health to improve the wellbeing of millions of people. It is the first time it has been rigorously developed for conservation. "We believe that the bright spots offer hope and some solutions that can be applied more broadly across the world's coral reefs," says Prof. Cinner. "Specifically, investments that foster local involvement and provide people with ownership rights can allow people to develop creative solutions that help defy expectations of reef fisheries depletion. "Conversely, dark spots may highlight development or management pathways to avoid." The study has been published in the journal Nature. Thirty nine scientists from 34 different universities and conservation groups conducted the research.